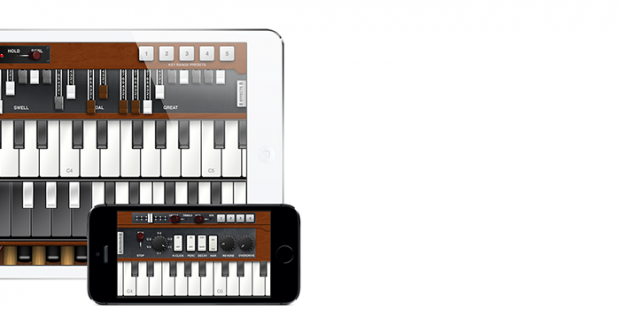 iOS Apps of insideout ltd.
Pocket Organ C3B3 is a musical keyboard application for iPhone/iPod touch that simulates the Hammond Organ. The sound is generated with the synthesis of the waveforms from “Virtual Tonewheel System” controlled by 9 drawbars like the actual Hammond Organ. You will be surprised at the real sound generated from this App! Pocket Organ C3B3 is a Hammond Organ in your pocket. – Pocket Organ C3B3 is programmed by Shinya Kasatani, the creator of best selling iPhone App “PocketGuitar” and is designed by Junichiro Yamasaki of “Manetron (Mellotron App)”. – Rotary Speaker effect can be changed to Fast (Tremolo), Slow (Chorale), or even Off (brakes). – Shake your iPhone to play spring shock (reverb crash) effect like Jon Lord (keyboard player of Deep Purple) or Keith Emerson (a member of the Emerson, Lake & Palmer, ELP). – iPhone’s built-in accelerometer gives you amazing glissando effect control. – You can add the User Memory Bank that allows you to store your own 20 patches (drawbars & effects settings) & Preset Packages with In App Purchase. Alina String Ensemble (Solina clone) now in App Store!